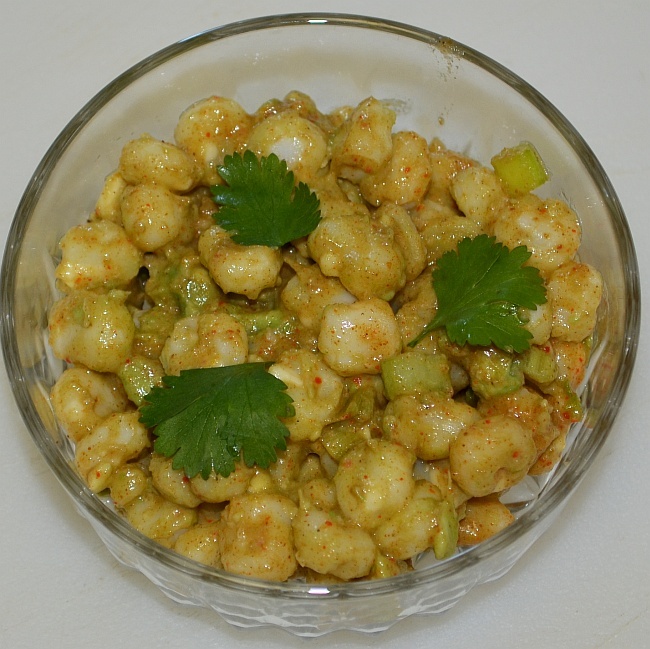 This hominy recipe has a flavor typical of southwest Native American cuisine. The avocado gives this dish a creamy texture that complements very well the taste of the hominy and spices. Put the hominy in a mixing bowl. Add the chopped green onions. Mince the avocado in the skin and scoop it out. Slice the serrano pepper, remove the veins and seeds and chop it finely. Add the spices, and pour the dressing on the mixture. Mix all the ingredients. Garnish with cilantro, if desired. Corn originated in Mexico. Native Americans learned to preserve corn by soaking it in lime water (calcium hydroxide, not the citrus fruit). Mexicans call hominy "nixtamal" which is derived from the nahuatl language words "nextli" (limestone ashes) and "tamalli" (dough of cooked corn). The English term "hominy" is derived from the Powhatan language word for maize. The process of soaking the dried maize kernels in a lime solution is called "nixtamalization" and it increases the nutritional value of corn by improving the bioavailability of amino acids, B vitamins and calcium content.